“What are you in the mood to eat?” It’s a question that, even when we are hungry, is often followed by silence. Ultimately, we start listing genres of food: pizza, burgers, Italian, Greek, Chinese, Canadian … wait, what? Canadian? What kind of food is that—polar bear steaks and reindeer sausage covered in maple syrup? Canada is not a country we generally think of when contemplating ethnic cuisine. There is one dish, however, that is uniquely Canadian: poutine (poo-teen), a dish of french fries topped with cheese curds and gravy. And just a few weeks ago in Salt Lake City, Prescott Strasters began selling poutine from Gravy Train, his formerly Los Angeles-based food truck. The Gravy Train Poutinerie serves traditional poutine with gravy and cheese curds, as well as adapted items like Philly poutine and poutine sliders, plus the All-American: tater tots coated in sausage gravy and topped with a fried egg. In honor of my many Canadian relatives, I went with the traditional. Warning: This is a heavy dish, to the third power. It’s a large plate of thick hand-cut fries, smothered with delicious brown gravy and then covered with thick, smooth cheese. When the cheese and gravy melt together, it gives the dish a subtle sweetness that makes it difficult to know when to stop. It was very filling, and I immediately found space in my schedule for a nap. Now that this cuisine from our neighbor to the north has arrived, it’s just a matter of finding it. 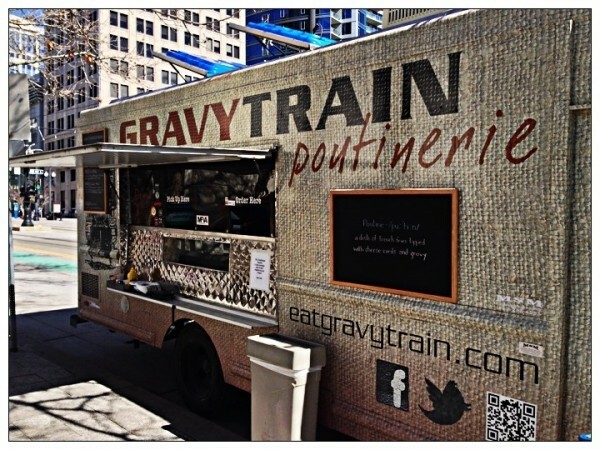 Follow @GravyTrainSLC on Twitter for updates on the truck’s location.